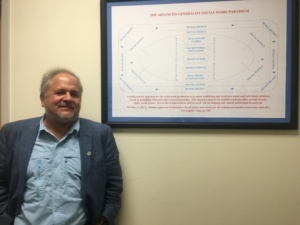 Dr. Joseph Wronka in front of his diagram for multi-pronged interventions with a human rights/social justice approach from the meta-macro to meta-micro levels of intervention to promote well-being, thus eradicating social and individual malaises. Please note that your information is never shared with anyone. I will simply read your comment(s) and respond to you directly. Thank you for your interest in human rights and social justice.